Capturing as much sunshine as possible is easy at Terrasse de Mer. Whether you want to do that on the beach or poolside at your private villa, you’ll have plenty of chances to soak up the sun. 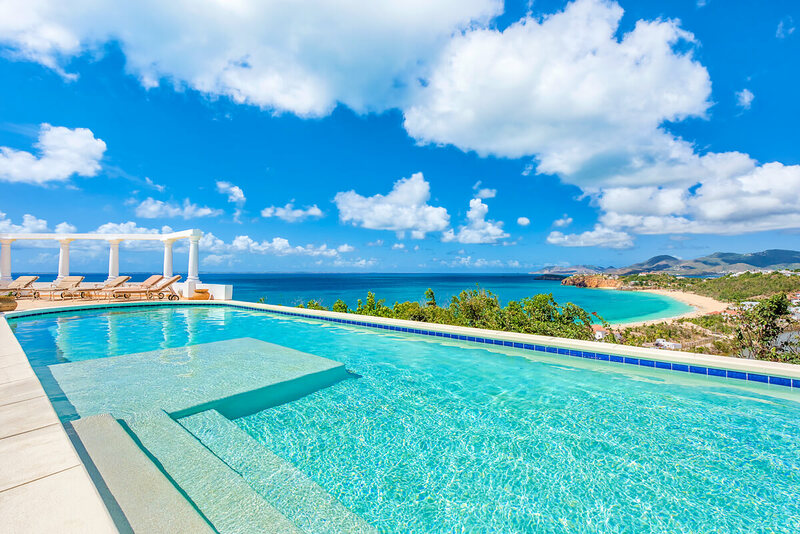 The villa is a mere two-minute drive to Baie Rouge Beach and just a five-minute drive to Cupecoy Beach. For pool lovers, there’s an expansive lap pool and a great patio for lounging. Terrasse de Mer sits at the top of a winding, hillside road high above Baie Rouge. This exotic oasis has panoramic ocean views and Grecian design throughout. The large courtyard opens to a stunning 360º view. The sight line stretches from Creole Rock in Grand Case to the Atlantic’s horizon. A wall of Grecian columns frame the sapphire sea. Expansive terraces and covered spaces for dining and lounging surround the long, heated pool. The terrace wraps around the ocean-facing side of the property and has several gazebos. One has a Jacuzzi, one has a dining table, and the other has a beautiful lounging space. White, cream and Indonesian teak throughout the interior creates a chic, soothing tone. The spacious living area is comfortable and stylish, with a flatscreen TV, lots of seating, and ceiling fans. It’s design incorporates vaulted, exposed beam ceilings and walls of sliding glass doors that face the sea. Just off the living room, the French country kitchen features stainless steel appliances, granite countertops, and exterior access. The dining room has seating for 8 and opens directly to the pool deck. There’s also a fitness room for cardio and weight training. All four bedrooms feature air-conditioning, king beds, and ensuite bathrooms. Two are connected to the main house, one is off the terrace, and the fourth is in the casita. The casita suite also has its own living room and private patio. All four bathrooms have large walk-in showers and dual vanities. Baie Rouge offers lounge chairs and snorkeling gear for rent, and there are several beach bars ready to serve snacks and drinks. This part of the island is largely residential, although shopping and restaurants aren’t far away. Two minutes drive to Baie Rouge Beach; Five minutes drive to Cupecoy Beach.